As Jesus passed on from there, he saw a man named Matthew sitting at the customs post. He said to him, "Follow me." And he got up and followed him. While he was at table in his house, many tax collectors and sinners came and sat with Jesus and his disciples. The Pharisees saw this and said to his disciples, "Why does your teacher eat with tax collectors and sinners?" He heard this and said, "Those who are well do not need a physician, but the sick do. Go and learn the meaning of the words, 'I desire mercy, not sacrifice.' I did not come to call the righteous but sinners." Jesus called a tax collector be become one of His Apostles. "What's so significant about that?" you may wonder. "Would it have made a difference if Matthew were a farmer or a policeman?" In our Lord's time, a tax collector was considered persona non grata among his own countrymen. You see, the Romans would hire local men to do their dirty work of exacting taxes from their fellow citizens. Moreover, tax collectors would take a nice cut on the money taken in tax. So, not only were tax collectors profiteering off their own people, they were flat-out traitors and consorters with the enemy. When we think of tax collectors, we may think of the IRS and the fact that we don't like paying taxes, but we don't think of IRS agents as enemies of the state. So, yes, the calling of a tax collector was quite significant - a total surprise for the Jews, so much so, that the Pharisees questioned our Lord's disciples about His choice of Matthew. This beautiful scene in today's Gospel is memorialized in art. There is a famous oil painting in the Chiesa de San Luigi - the Church of St. Louis - in downtown Rome. It's the French national parish. 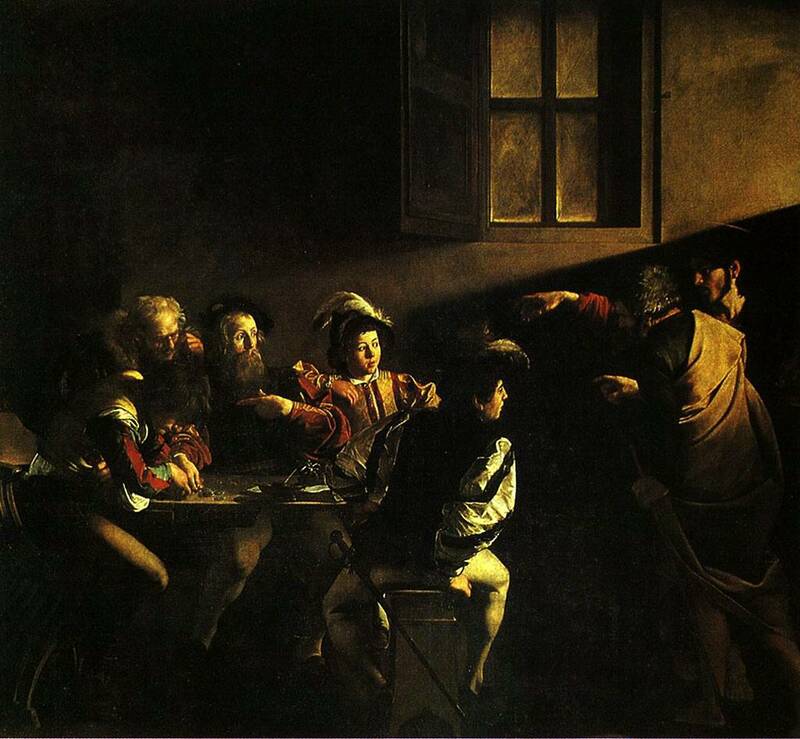 Off of the left nave, you can find one of Caravaggio's works - The Calling of St. Matthew. In it, our Lord is off to the right, wearing clothing he would have worn in His own day, with flowing robes. Our Lord has his arm extended and is pointing at St. Matthew. Matthew is sitting at his customs post, not in clothes similar to our Lord's but in clothing contemporary to Caravaggio's time - late Renaissance. 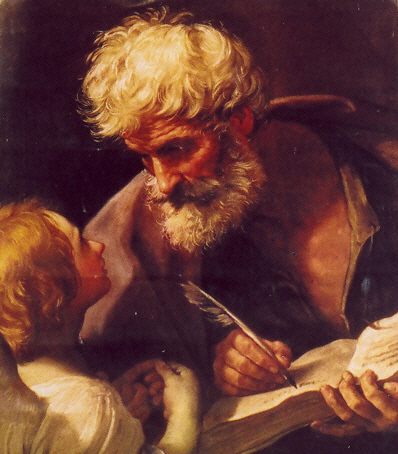 Matthew is dressed in this way so as to indicate to the viewer that while St. Matthew was called once in history, many more "Matthews" are called in every generation to become disciples of the Lord. In the painting, the customs post is a dim room and the rest of the tax collectors are sitting around a table counting their money. Matthew, however, is staring back at our Lord and his face is lit up as if our Lord's hand was emanating light, shining upon Matthew's face. Matthew's countenance is priceless. It indicates a total surprise, as if he was saying, "Who, me?" I'm a sinner - a tax collector - you can't be serious!" And yet, Jesus was dead serious. He was serious about Matthew and He is serious about you and me. When Matthew has his conversion, he throws a party - a party! What an incredible day - he starts out as a sinner and ends the day an Apostle and later, an evangelist! Then Jesus uses this event as a teaching moment. He addresses the Pharisees who question the other disciples and implicitly Jesus about His choice of Matthew. Christ says that He has come as the Divine Physician to heal the sick - the sinner - not to coddle the righteous. He goes even further - our Lord tells the Pharisees that mercy is more pleasing to Him than sacrifice. This was a great affront to the Jews, who saw Temple sacrificial worship as the center of Jewish life. Our Lord implicitly refers to the sacrifice of MERCY that he would enact at Calvary as the new and everlasting covenant that is now perpetuated in the sacrifice of the Mass - the greatest act of mercy known to man. For in it, God becomes present to us to heal and nourish our souls. In order for the events in Matthew's conversion to become a reality in our lives, there is an important "catch." That is, we, like Matthew, so well depicted in Caravaggio's work, have to admit our sinfulness. If we refuse to admit our sinfulness, how can we receive Christ's mercy? You see, receiving mercy is predicated upon admitting the truth about ourselves - that we are sinners in need of God's mercy. Consider the lives of the saints. Each of them, as they grew in holiness, became painfully more aware of how far they were from Jesus. It's quite a paradox. You would think that the more you pray and the closer you come to our Lord, the holier and more "worthy" of heaven you would feel. In reality, the exact opposite is true. The closer you come to Jesus and contemplate His perfection, the more aware you should become of your own imperfections. That is why Pope John Paul II went to confession daily and why Blessed Mother Teresa would confess weekly. It's not because they were in mortal sin. Rather, it was because they wanted to acknowledge their lack of perfection in light of their knowledge and love of perfection incarnate. If you leave here this morning and think that all that Father said today is that we're all sinners, you're missing the point. While it is true that every single one of us is a sinner and in need of God's mercy, the upside of it all is that we know that victory can be ours if we cooperate with God's grace to have the humility to acknowledge the truth about ourselves and confess. Out in the world, we all try to put on different facades and personas to convey a certain image about ourselves but God knows us as we truly are and if we are honest about ourselves with Him, we know deep down that we are in desperate need of His mercy. God knows us at our core, unlike any other person. So, coming to terms with the truth about who we are in light of Him is essential. In the First Letter of John 1:8-10, we read, "If we say we have no sin, we deceive ourselves, and the truth is not in us. If we confess our sins, he who is faithful and just, will forgive our sins and cleanse us from all unrighteousness. If we say we have not sinned, we make him a liar and his word is not in us." In other words, we must avoid any pretense in claiming that we do not sin. The degree to which we continue to admit our righteousness is the measure of how far away we remain from Jesus because of the hardness of our heart. As a friend told me once, "If you don't think you sin, ask your spouse." But thanks be to God, who gives us the victory in Christ Jesus! As we enter more deeply into Ordinary Time, we do well to take time to make a good examination of conscience, to confess our sins monthly and to continue to trust in the mercy of God that endures forever.